Downloading the new Grambling State Mobile App is easy. Visit device application store or marketplace and search for “Grambling State” and click the “G” or visit www.gram.edu/mobile and click the icon for your device platform. Click the “G” to apply, learn about, or schedule a tour through the Grambling State mobile application. You can keep up with GSU news and click to learn about anything from academics to housing and sports at Grambling State. Click the “G” for easier access your professors, assignments in Canvas, or even campus e-mails and messages. From checking your grades to your Tiger One card balance, the Grambling State mobile app brings important services to your fingertips. Click the “G” for access to everything from Canvas to calendars. 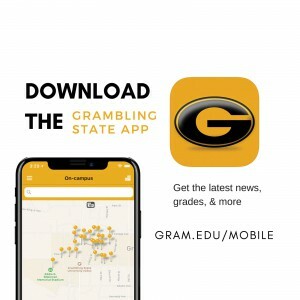 The Grambling State mobile application now makes it easier to stay connected and share about the great things happening at Grambling State. Visit and share www.gram.edu/mobile today.